Former Virginia AGs Argue That Regulators Should Be Allowed to Approve Utility Rates | News and Features | Style Weekly - Richmond, VA local news, arts, and events. Scott Elmquist Former Attorneys General Ken Cuccinelli and Andrew Miller were in town to support consumers in a Supreme Court case about utility rate review. Ken Cuccinelli would really like to hand you a big refund check. The former attorney general and 2013 gubernatorial candidate was in Richmond on Friday — from “the sticks of Northern Virginia,” as he put it— to support a case before the Virginia Supreme Court. 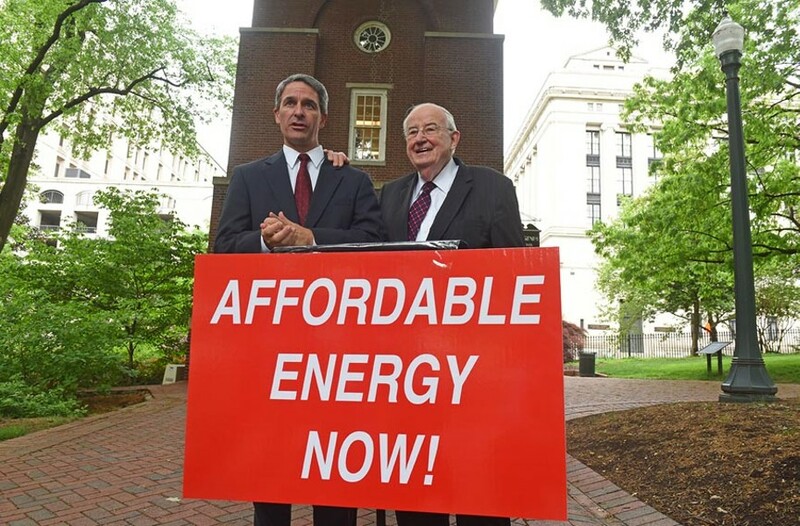 Along with Andrew Miller, a Democrat and Virginia attorney general from 1970-77, Cuccinelli is trying to help overturn a 2015 bill that freezes the State Corporation Commission’s ability to regulate the rates of Dominion Power and Appalachian Power — a bill that he calls unconstitutional. It’s not a topic that brings protestors to the streets, like Dominion’s Atlantic Coast Pipeline. But it’s one that has allowed the regulated monopolies to collect energy bills without oversight for a few years now. And it will continue to through 2020 under the 2015 law. Here’s the simplest explanation of what happened: During the 2015 session, Dominion convinced the General Assembly that former President Barack Obama’s Clean Power Plan, meant to reduce carbon pollution from power plants, would impact it negatively and a rate review freeze was the solution. Dominion’s chief executive, Thomas Farrell, lobbied Gov. Terry McAuliffe himself, and the bill was the result. The commission voted to uphold the law soon after, stripping itself of the authority to regulate the utility monopolies. Last month, President Donald Trump killed the Clean Power Plan, and opponents of the state law tried to convince the governor to call a special session and propose a repeal. “The governor agreed that it was a mistake, that it was wrong — he said it on the radio — and then promptly did nothing about it,” Cuccinelli said Friday. Miller and Cuccinelli, who are supporting the appellants for free, were unsparing in their critique of current Attorney General Mark Herring, too. Herring, they said, had reneged on his constitutional duty to protect consumers, arguing for the State Corporation Commission in this case. Herring initially opposed the law in 2015, and says his defense is rooted in its constitutionality, not its wisdom. Cuccinelli called it “crony capitalism” and Miller urged a look at Herring’s political contributions from Dominion — $104,500 total, according to the Virginia Public Access Project. The same database shows Dominion gave $181,500 to Cuccinelli’s various campaigns over the years. Donations from Dominion have played an interesting role in the current election season. Democrat Tom Perriello, who is seeking his party’s nomination to run for governor, has pledged not to accept Dominion contributions. Republican Corey Stewart, who’s seeking his party’s nomination for the same job, has said he will support legislation to ban such contributions. More than 50 Democrats running for the House of Delegates have taken the no-contribution pledge. Republican candidate Frank Wagner, on the other hand, supported the bill to remove regulation and has received $86,985 from Dominion. A ruling by the Supreme Court on this case is expected between June and September. A decision against the commission would see backlogged refunds to customers of the companies. Cuccinelli added his concern for low-income Virginians struggling with bills. “The is literally one of those few issues, just this case, that touches over 70 percent of Virginia households,” he said.